CS&tS: We’re inspired by everything from the soundtrack to “The Wiz” and “Wattstax” to 60s girl groups like The Exciters. We take a lot of our cues from disco, electroboogie and 70’s/80’s dance artists like ESG, Giorgio Moroder, Sylvester, Grace Jones, Labelle, Klymaxx and Kid Creole & The Coconuts. We’re also influenced by 90’s dance music like CeCe Peniston and Inner City. We like to think of them all as our “spirit guides.” The past few months have actually been pretty hard since we’ve lost a lot of our spirit guides – Whitney, Don Cornelius, Donna Summer, Robin Gibb, Chuck Brown. We like to pay tribute to them during our show with the song “Maegan’s Jam.” It’s a dance tribute that involves lots of audience participation. Alexia: I feel like you all bring some diverse musical experiences to the table- can you tell us a little about some of your musical backgrounds/other/previous projects? CS&tS: Yeah, we’re kind of a supergroup. Like Damn Yankees or the West Coast Rap All-Stars. Between the six of us, we’ve been playing in bands, DJing parties, organizing events like Ladyfest and Girls Rock! DC, and generally making trouble in and around the DMV since before the days of racially insensitive food trucks. Elizabeth Sauvage played bass in Mess up the Mess. Currently she shares vocal duties and plays keyboard in Troll Tax. Jason Sauvage (aka Hit Factory) is also in Troll Tax and was one-half of the legendary Hott Beat. He also runs Paroxysm Records. 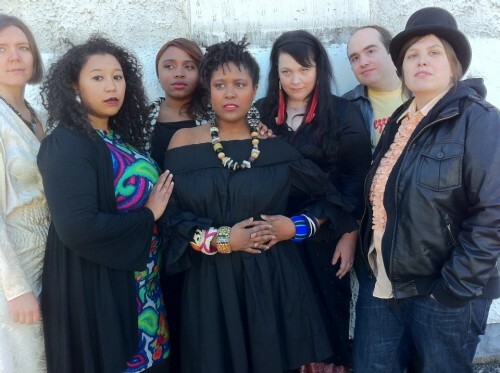 Crystal Sauvage is in the band Downbeat:Beatdown and Katie Sauvage plays cello in the Capital City Symphony. Kristina Sauvage and Maegan Sauvage were co-founders of the First Ladies DJ Collective and both spin frequently around town. Maegan is one of the DJs behind She.Rex and Kristina throws the 80’s synth-funk night Work the Walls. Alexia: There are a lot of you in the group! Is practicing a challenge? What is the songwriting process like for you all? CS&tS: We’re lucky that practice isn’t nearly the challenge it could be. Our songwriting process is very fluid and collaborative. Sometimes Maegan may have a beat or sample in mind or someone comes in with a melody. The most common scenario is that we’re sharing stories at practice, then next thing you know a phrase from a conversation gets turned into a song. About 80% of those conversations are overheard on the Circulator. The Circulator is a great source of inspiration and it’s only a dollar! Two dollars you could be the next Lennon/McCartney. Three dollars and you are the Brothers Gibb (RIP Robin!). Alexia: What can someone expect from a Coup Sauvage & the Snips show? CS&tS: Much like Michelle Obama, we want the children to MOVE. You will twerk, back it up, drop it low, and shake it to the ground at our show. You should also expect to be implicated. Art isn’t a one way street. We’ll give you dazzling choreography and over-the-top fierceness, but we’ll also probably leave you a little shaken. That’s just the Haus of Sauvage way. We’re also totally obsessed with the performativity of “realness” and love the idea of bringing sass and pageantry back to the stage. In short, expect a spectacle. A totally unhinged and opulent spectacle. Alexia: What do you have planned for the future? Can we expect any recordings soon? CS&tS: Our dream is to one day play a tiny seedy club in Hamburg, Germany. For now, we’re focused on our upcoming Haus of Sauvage Variety Show Revue at Art-o-matic on Fri Jun 15. Y’all, there will be a tap dancing mime. We do not mess around. Recordings and matching manicures are also on the horizon. We have some sickening new songs in the works too we’ll be debuting at our next shows. So as we like to say, hang on to your neckerchiefs and evening bags! The Haus of Sauvage is just getting started. You can catch Coup Sauvage & the Snips this Saturday, June 2nd at Comet Ping Pong! See a video clip from their first show at the Black Cat here.